While we might not have bears hibernating in our caves or packs of wolves roaming our countryside (anymore), Ireland has its fair share of spectacular wildlife, from the cute and cuddly to the downright awe-inspiring. From one of the fastest birds in the world to one of the largest mammals, we have some amazing species to see right here around our beautiful island. With an average length of 5 – 7 metres, the second largest fish in the world is a filter feeder that can be seen off the Irish coast. These stunning creatures are most frequently found in the North Atlantic between April and September. If you are hoping for a sighting, the waters of Inishowen are a good place to start. The IUCN (International Union for the Conservation of Nature) lists the basking shark as endangered in the North-east Atlantic – just another species found in and around Ireland that needs protection. Check out the Irish Basking Shark Project. If you are lucky enough to spot one of these amazing sharks then you can record your sighting on their website to help increase knowledge about the species’ movements. While we have other owl species in Ireland, this one is found widespread throughout the country. You are most likely to see this bird flying across the road in front of your car headlights. 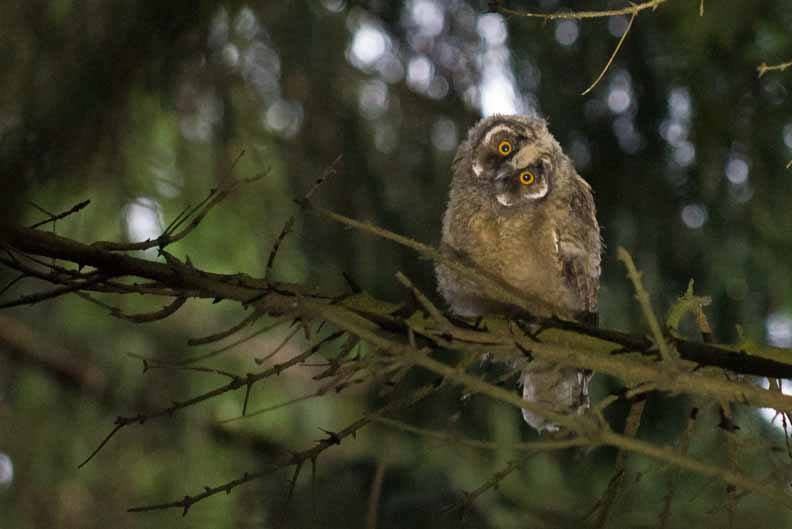 Long-eared owls are hunters, feeding on frogs, birds and small mammals. The owl’s feathers are adapted to allow almost silent flight and their hearing is so sharp they can catch their prey in complete darkness. Although tricky to spot, these beautiful creatures are well-deserving of your Irish wildlife bucket list. BirdWatch Ireland have more information on their website. Fledgling long-eared owl. Photo taken by Brian Carruthers. 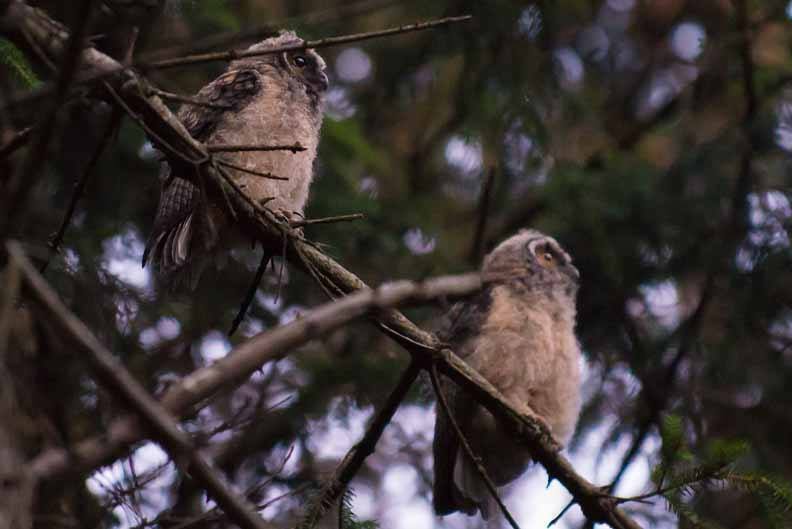 Fledgling long-eared owls. Photo taken by Brian Carruthers. Ireland has only one native terrestrial reptile – the common lizard. It is found in many areas across Ireland and occupies a range of habitats, favouring south-facing damp, tussocky grassland and areas such as dunes (think of Bull Island, Dublin) and woodland tracks (such as Glendalough). The lizard’s body temperature goes down during the night and then it will bask in sunlight during the day to reheat. 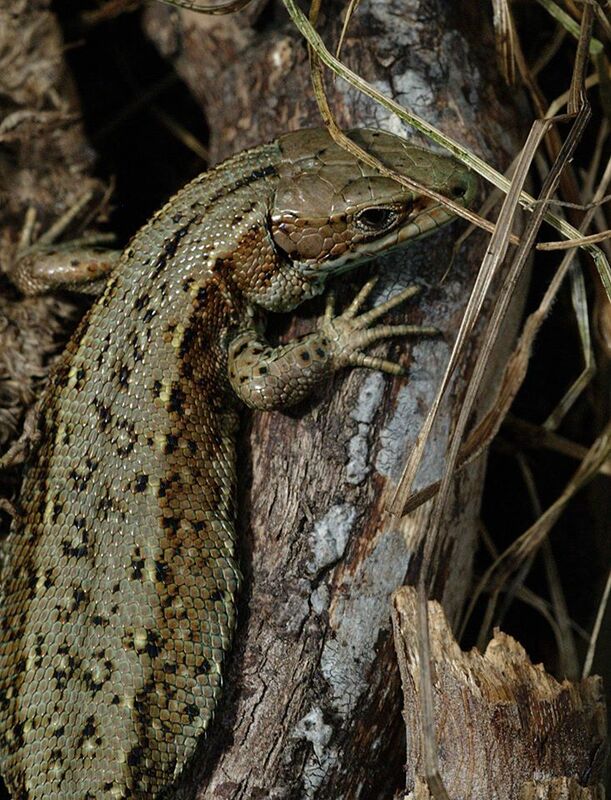 Common lizards can use a trick to avoid predators called caudal autotomy where the lizard sheds its own tail in an effort to confuse the predator. Check out the Herpetological Society of Ireland for more info on lizards and Ireland’s other native herpetofauna. Common lizard. Photo taken by Rob Gandola (Herpetological Society of Ireland). Although an elusive creature, this iconic mammal can be found in many rivers and lakes across Ireland with territories that can be several kilometres long. They are mostly fish-eaters, but can also eat frogs, birds and small mammals. An otter’s den is called a holt and they can have a number of these in their territory. They can take advantage of burrows created by other wildlife such as foxes or natural crevices like those created by tree roots. Our Irish otters aren’t the same as the famous Californian sea otters that hold hands to stop from drifting apart… but they’re just as cute! Find out more about these beautiful native Irish mammals on the Vincent Wildlife Trust website. This diamond-shaped ray gets its name from its spines and is commonly found around Ireland’s coasts. Their fairly wide geographical distribution means that while they can be found around Irish estuary mouths and sandy banks. They can be also be seen off countries as far as Iceland and Namibia. The thornback ray is classified as near threatened on the IUCN RedList. A moth in a list of ten of Ireland’s amazing animals? Yes. This moth earns its spot on looks alone. Found in Ireland, in both urban and rural areas between May to July, this is just one of the many beautiful moths and butterflies that inhabit Ireland. Check them out here. 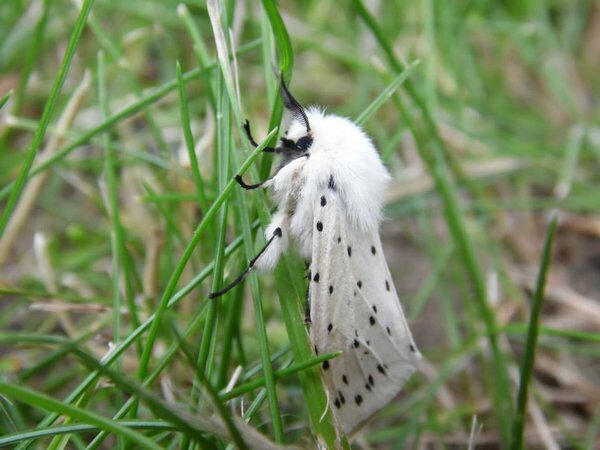 White ermine moth. Photo taken by Oisin Duffy. Peregrine falcons are the fastest birds on the planet and we are lucky to have them widespread across Ireland. 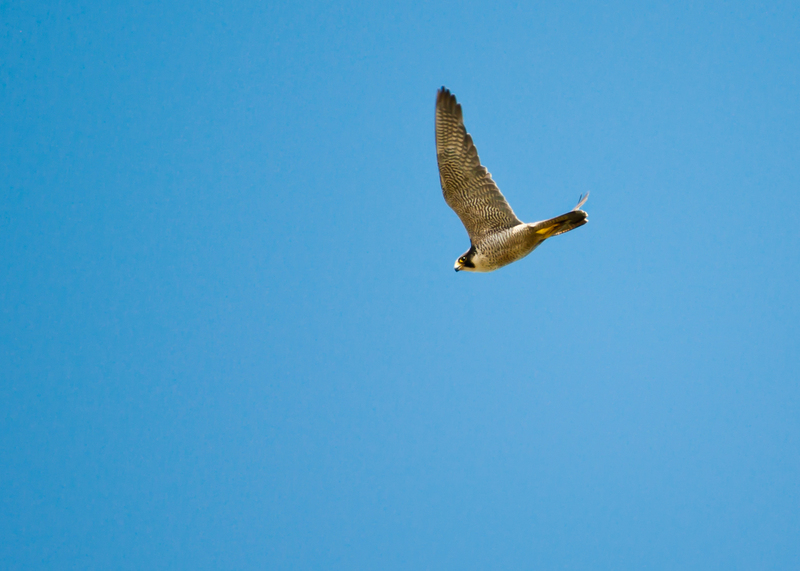 Believed to reach speeds of 240 km per hour, the peregrines’ prey includes pigeons, waders and wildfowl. A good place to spot them is on estuaries during the winter, but they are also found in areas such as Glendalough. Want to know more? Click here. Peregrine falcon. Photo taken by Kristina Abariute. 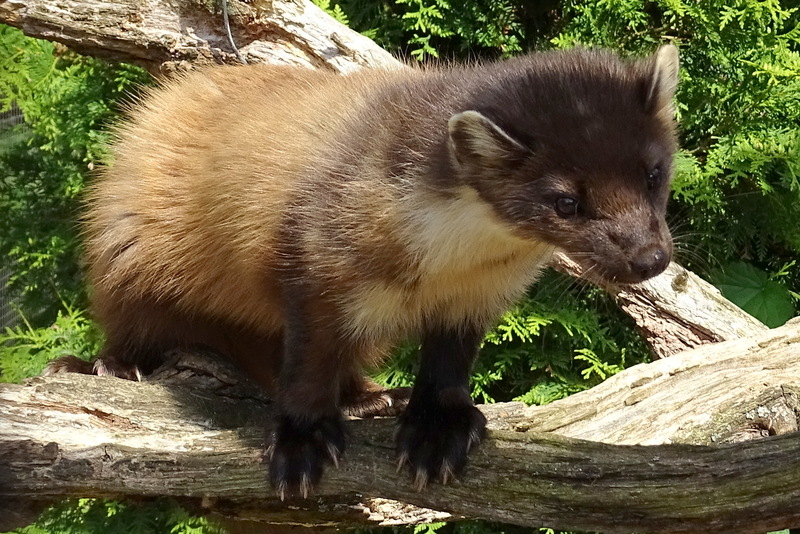 The pine marten has been receiving some undeserving negative publicity lately. This beautiful creature is known as cat crainn in Irish, translating to tree cat. It is a very shy mammal, mainly occupying woodlands. Unpopular with some due to its affinity for chickens, it is thought to have an important relationship with squirrels. The grey squirrel is a non-native species in Ireland. It carries (but is not affected by) squirrel pox virus. Our smaller, native red is affected by this virus. The grey also out-competes the red squirrel for food. It has been found that areas with pine martens have reduced numbers of grey squirrels. There has also been a positive correlation found between numbers of pine martens and red squirrels; you can read more about this fascinating study here. Many people think of places like Australia, Boston or South Africa for whale watching but the truth is we have some spectacular opportunities right here on our doorstep. The coastal waters off Cork and Kerry in particular see a number of cetacean species at different times of the year including bottlenose dolphins, minke whales, fin whales and Risso’s dolphins. Humpback whales are not found off the coast of Ireland year round so if you are planning on booking a boat trip to see these magnificent creatures make sure you check out the best times of year to increase your chances. Spotting a humpback whale’s spout or seeing its massive tail gracefully rise and follow it into the water is an experience you won’t quickly forget. 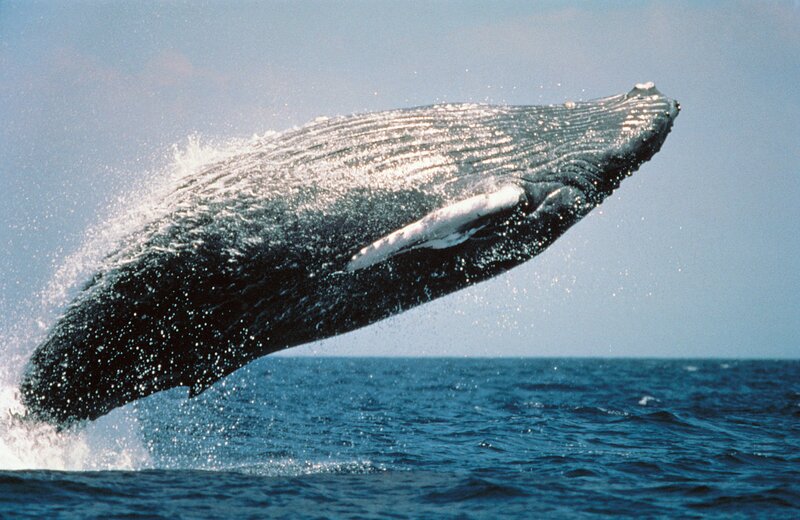 Humpback whales have recently been making the news for rescuing other marine mammals from orcas. National Geographic has the story on the massive marine protectors here. Ireland has nine confirmed resident species of bats. Bats can eat thousands of insects in a night (so think about what would happen if we didn’t have any bats!). In Miami where the Zika virus has affected a number of people, an official has unveiled a plan to attract bats to the area in an effort to help control the mosquitos. In Ireland, the Daubenton’s bat is usually found flying low over the surface of water, such as canals and lakes. While it tends to catch prey such as midges using its mouth, it can also catch prey with its feet. Bat Conservation Ireland runs a volunteer-based monitoring programme for the Daubenton’s Bat so check out their website if you would like to help! Learn about Irish bats, how to watch them and how to make a bat box from Bat Conservation Ireland. Daubenton’s bat. Photo taken by Frank Greenway. Thanks for providing the beautiful owl shots, Brian!